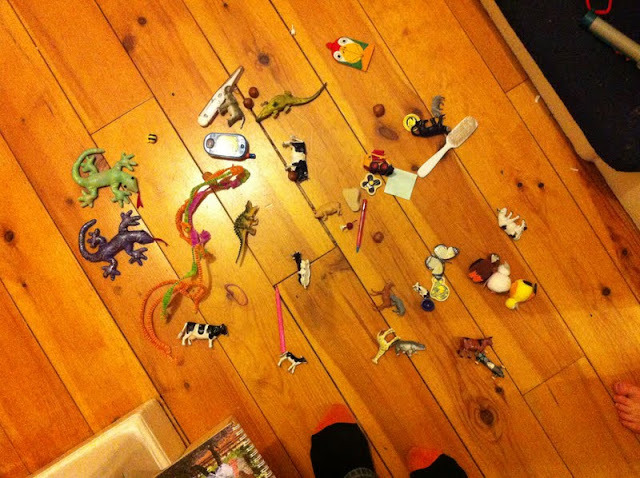 Yes: five toy cows, two sheep, a dinosaur, a giraffe, a deer, a crocodile, a hippo, a panther and a pig, three Easter chicks, two pencils, two gekkos, a butterfly, a toy mobile phone, two wooden jigsaw pieces, a tangle of pipecleaners, a baby's hairbrush, an electronic thermometer, four hazelnuts, one parrot finger puppet and a plastic bee had all at one time or another been posted into the small hole at the front of the speaker by small children. Back to the Oakshott - I had to show you the thread tangle I trimmed away after washing it. The variety of colour illustrates how the shot cottons are woven - as each shot colour has a different thread woven with the red. There must be some sort of textile art I could do with this - it's beautiful really! giggling at the contents of your speaker! That is so familiar!! Those Oakshott threads are just beautiful! How many years have the kids been posting these treats? At least it wasn't unwanted food! Small blessing. Laughing at the stuff you pulled out of the speaker!! And that IS a lovely tangle of thread. Aren't the Oakshott threads gorgeous?? I think I could rival such a haul were I to empty out our speakers - very funny! That is so funny, you had quite collection in your speaker. The Oakshott cotton is beautiful. Looking forward to what you make with them. That is so cute - all those little objects. And the oakshot will be beautiful in your project for sure! Oh how the speaker contents made me giggle! Don't you just love the little monkeys! So funny. Thanks for sharing.